DealRoom is a smart and secure M&A deal platform designed to help you close deals faster. The world of mergers and acquisitions (M&A) is fast paced, immensely intricate, and time-consuming. And traditional Virtual Data Rooms, Excel Trackers, and lengthy email threads are not the only way to complete diligence anymore. DealRoom designed a diligence management platform that doesn’t follow typical M&A software trends. Based on Agile principles, we aim to create a more efficient and innovative process. Our goal is to help close deals faster. DealRoom’s M&A project management software allows teams to be connected more than ever before throughout the deal’s lifecycle. All communication, file sharing, and document collection can be completed within the platform, instead of across multiple channels. Users can be aware of their tasks and have a bird’s-eye view of the deal’s progress. DealRoom helps eliminate work silos and miscommunication. Our granular analytics can spin up detailed reports within seconds. This helps prevent potential bottlenecks and predict possible concerns before they even happen. It’s time to use an M&A software that is efficient, collaborative, and innovative. Collect documents in a central platform for convenient management, and share high-value content quickly and securely with colleagues, partners, counterparties, stakeholders, and regulators. Each user can keep track of what documents are their responsibility and request additional needed information from other team members. Our platform lets you assign users as reviews, followers, or assignees on specific tasks. Never miss a deadline by setting due dates and sending reminders to assignees. All work done in the platform is updated in real time, so never worry about version control again. Seamlessly transition between different deal phases, and stage information before going live. DealRoom helps teams plan for integration throughout diligence, and have continuous access to crucial deal analytics. Participate in group work from anywhere in the world with complete and secure mobile access. Protect all documents with file-level encryption; manage file, folder, document, and user permissions and access rights. All permissions and access rights can be updated at any time. Also, our platform has 256 bit SSL encryption and strategically separated data centers providing high security. Many teams work on more than one deal at a time. With DealRoom you can easily open new rooms, and have multiple deals going on within the platform at a time. We hope to help your teams improve overall workflow and team collaboration. Our analytics let you see granular information, such as which users have viewed a document, when they viewed it, and how often they viewed it. You also can access multiple charts and maps to better understand the data. All of DealRoom’s analytics can be exported into a PDF or Excel within seconds. Mergers and acquisitions require meaningful strategies, comprehensive due diligence, and post-merger integration planning. Whether a deal is buy or sell-side, involved parties need efficient and secure access to sensitive information. This allows them to complete diligence and find the proper buyer or seller. Diligence management software is going to be a part of a deal for its entire lifecycle, from staging to post-close. And teams need to use a platform they trust. It needs to be efficient, encourage collaboration, and 100% secure. That’s where DealRoom comes in. We assist teams with onboarding and training, and a room can be set up within minutes. We also understand that you may have some “old school” members on your team. This is why our platform still allows Excel imports and exports. Due diligence can finally be completed on one fully integrated platform, instead of across multiple software channels. 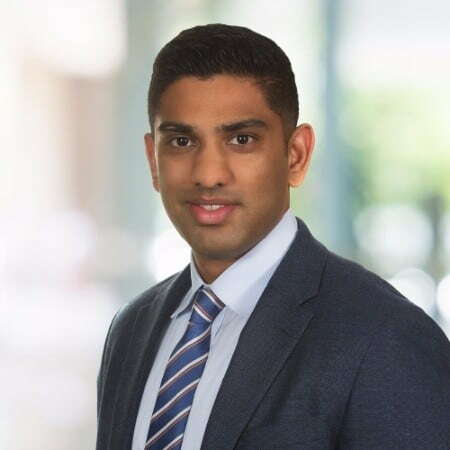 Unlike traditional M&A software companies, DealRoom eliminates the need for Excel trackers, disconnected questions and answers, and unsafe file transfers methods. Teams can request files and documents from other users through the platform. You can upload any file type and quickly add additional users, and set customizable permissions. 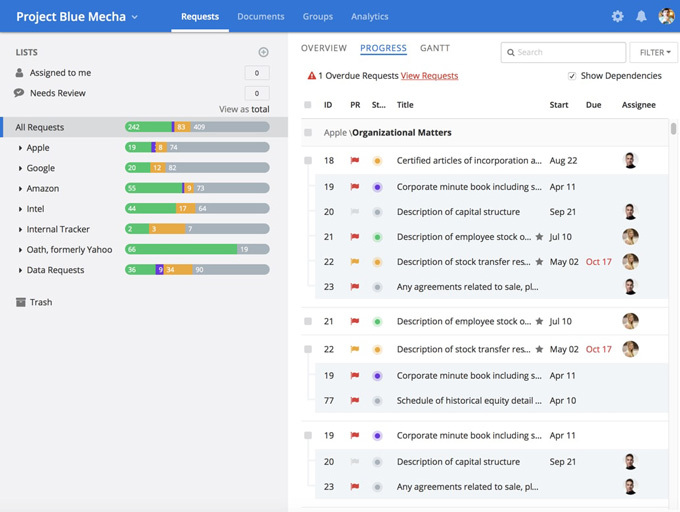 With the requests tab, you can clearly define responsibilities to individual team members, which promotes accountability. Users can set additional roles such as followers and reviewers. If a request is made in the future that seems similar, the platform will suggested related files to prevent duplicate work. Users can also set their notifications for as often as they want, allowing everyone to stay informed. DealRoom M&A tools help teams plan for post-merger integration along side diligence, which helps strategic planning and problem solving. Many companies use outdated or inefficient M&A software tools when it comes to the post-deal integration phase of M&A. The biggest culprit is Microsoft Excel. The software is still a very powerful and useful tool for core business functions, but lacks real time features. Excel also requires a complex array of document sharing and collaboration during the post-deal integration phase of M&A. DealRoom’s M&A integration software is designed to consolidate and streamline these problems. Teams can use the information collected during diligence throughout the post-merger integration process. This helps goals align, strategies to be made early, and helps teams maximize deal value.  Focus on creating an efficient due diligence process and closing deals faster, all with one smart integrated platform. DealRoom is customizable for all M&A transaction types. 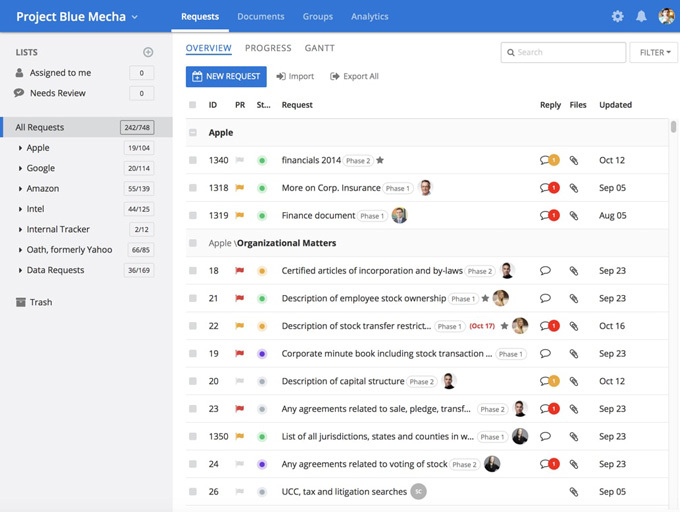 Say goodbye to scattered communications and unorganized document and file collection, no matter the number of deals the team is working on. DealRoom software solutions are designed based on Agile principles, instead of a traditional Waterfall methodology. This ensures that our software provides collaboration, flexibility, data insights, and continued innovation. Our platform utilizes smart technology such as machine learning, smart search, and living linking to help prevent duplicate work. Know which users are looking at specific documents and more with DelaRoom’s advanced analytics. Effortlessly bulk upload documents, files, and folders to immediately start diligence. Auto-indexing keeps everything organized and easy to find. Save time by bulk inviting new users to the room. Users can view similar requests or add new requests regarding open documents directly from the viewer. Quickly import existing diligence request lists from Excel with the click of a button. Check on list activity with our visual requests heat map, and sort by views, views coverage, and time spent. With DealRoom’s reporting you can track diligence progress, documents’ activity, investigate buyers’ engagement, and more. Stay informed on the status of every request created in one convenient viewing page. 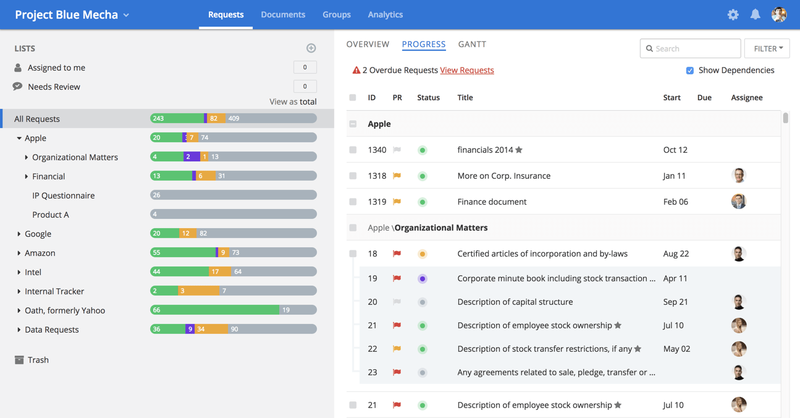 Organizing diligence requests in one place eliminates the need for Excel trackers, frequent meetings, and one off meetings. Effortlessly combine your M&A CRM and analytics from each deal with our Salesforce integration capability. Simply give folder and document permissions, pick from view, download, download original, and edit. 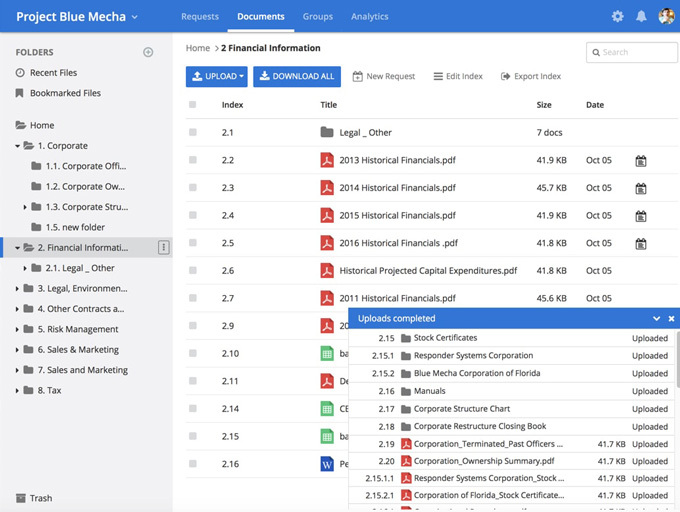 We utilize machine learning to suggest answers and related files to prevent duplicate work and enable faster due diligence. "Great M&A platform! I have used a lot of virtual data room software in the past and Deal Room offers an extremely intuitive platform that is very easy to use. It has all the features our company would need in a data room provider at a very competitive price point. The customer service and client support team are great and very easy to work with. Both Kison and Julia are extremely responsive and helpful. It is a highly dependable m&a platform that I would highly recommend." Ready to try a pricing plan that makes sense and join the thousands of companies in our customer base? DealRoom offers flat-rate pricing with no overage charges, unlimited users, and unlimited data. Find out more about DealRoom’s online M&A platform pricing options. Once you pick a plan, you can have a room up and running within minutes. Start utilizing DealRoom’s M&A software solutions. Our Agile M&A platform will help you close deals faster, without compromising value.